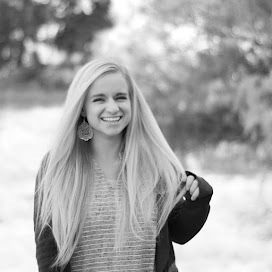 Well hey there friends! First things first... Transfer doctrine came this week and I am INFACT getting transferred AGAIN beeecccaaauuussseee President called me to be a Sister Training Leader (STL. Like a Zone Leader for sisters) on Saturday. So I'm getting transferred to the New Smyrna Beach Ward tomorrow which is neighboring this ward and also touching the Daytona Beach Ward boundaries. So I'll have served in three areas that are touching. Haha I'm going to be with Sister Simpson who is SO COOL! Holy cow. I'm pumped. But I'm also freaking out a lil but it's fine. Second big news of the week: W GOT BAPTIZED! Holy. It was a good week. So here's how my week went. It was pretty cray. Monday was pretty normal. I emailed Y'all, we did the P-Day thangg and then had a lesson with W. For the summer there are SIX little girls living at their house (not to mention the six adults) all under the age of 10. Those kids are all obsessed with the missionaries and it's the cutest thing. When we knocked on the door one of the little ones ran to the door, but couldn't get it open. She yelled "IT'S THE SISTERS! I LOVE THEM. DO YOU HAVE ANY IDEA HOW MUCH I LOVE THEM?! SOMEBODY OPEN THE DOOR AND LET THEM IN!" My heart melted and when we finally got in we were attacked by a thousand hugs. Holy cow. I love these kids. 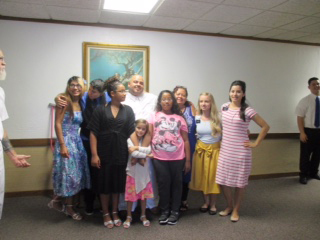 After our lesson with Will we went to FHE with the Glase family. We played Book of Mormon pictionary and had KFC. Can life get better? I submit that it cannot. Tuesday we did some finding and taught our pal R. He is the cutest old man and when I first went to his house I thought I had left the country because it is in the jungle. Then we went to see one of our investigators whose mom was a little less than thrilled to see us. ☹️ Then we decided we needed to get ice cream to make us feel better. 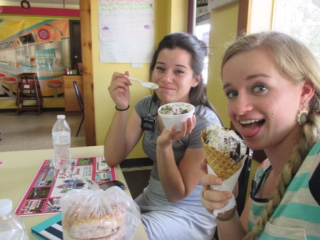 We went to this little hole in the wall called Three Sisters Ice Cream. It's where all the local old people go to gossip. We became friends with a few of the "sisters" that own it. Then we left with our ice cream. Sister Larsen was holding two GIANT ice cream cones and was trying to back me... THEN this random GARBAGE MAN showed up and jumped off the back of his truck and was like "I'LL DO IT!" So Sister Larsen hopped in the car and the garbage man backed me out of my parking spot. And that's how I got a garbage man to back me on my mission. After we made a mess with our ice cream (it melts faster here in Florida) we taught an awesome lady in the ward named Sister Watson. Then we taught W and talked about the restoration and he has such a strong testimony of it it was so awesome. Then we had dinner with the Loughmillers who are INFACT the coolest family. Then we went to addiction recovery which is my favorite thing ever. Wednesday we spent some time with our friends down at Trinity United Methodist Church working in the food pantry. We visited the S's who are my favorite. 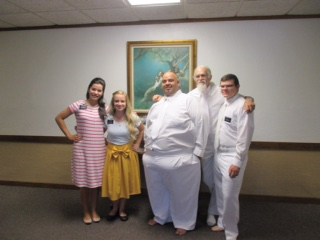 We had a good lesson with W and we went to Book of Mormon class. 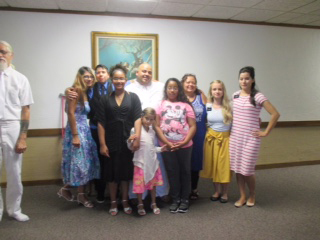 Thursday we had district meeting. I had a Safe Guards thought. We had lunch with sister Riancho and we did lots of dishes with her. We taught W and then we taught M who is a recent convert. Friday we did some weekly planning. Then we were headed to a ward dinner and the heavens opened and there was a TORRENTIAL DOWN POUR. But don't worry. We made it to the church wet and safe. That was a fun time. We had a lesson with W after the party. SATURDAY WAS THE BEST DAY. holy. 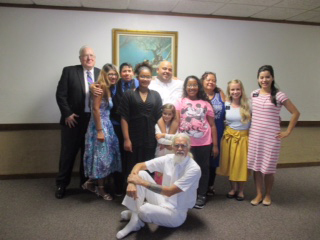 We went to the DeLand 1 Elder's baptism for a guy named W, then we went to our baptism for W!!!!! It was SO GREAT! He had to get dunked twice and then he came up out of the water and was like "Amen!" 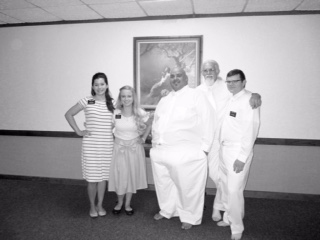 Haha Sister Larsen spoke and did a swell job. W's sister that's not a member asked if she could say a few words and HOLY GUACAMOLE she had us all in tears. It was beautiful. Then we socialized with the peps that came and headed over to their house for a surprise party for W. Puerto Ricans know how to party and they treated us like we were just part of the family. 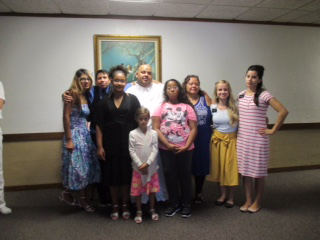 It was one of the most fun moments I've had on my mission just knowing I had helped this family come a little closer to God and then to celebrate it with them. They made me feel so loved and my heart is full. 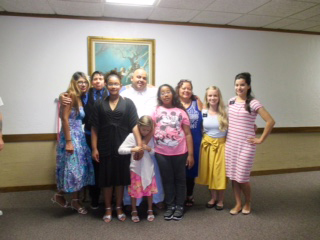 Saturday night we were waiting for transfer doctrine and we got a call from the Leesburg sisters telling us that one of them was going to come here with Sister Larsen. So I knew I was leaving, but I didn't know where or why I was leaving because I have only been here one transfer. 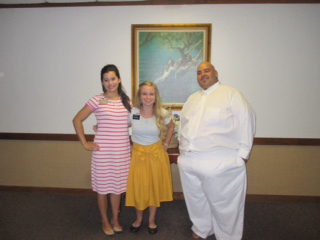 BUT THEN we got a call from a random number and I was like "Hi this is Sister Reid and Sister Larsen!" And then the voice on the other end said "Hi Sister Reid! This is President Clark!" And I was like "Hi President" and then he asked me if I would be a Sister Training Leader and I told him yes and at about that time I went into shock and don't remember the rest of the conversation. Hahaha later the Zone Leaders called and told me I'm going to New Smyrna with Sister Simpson. I'm beyond excited and a little overwhelmed, but mostly excited. Holy cow. Sunday was fun. W got the Holy Ghost. Whattttt?! Elder Gentry gave all of us missionaries selfie sticks in our favorite colors. I have a selfie stick now. We had dinner with the Ward's and they are my most favorite family. We also visited the L's. Today we are going bowling with some other missionaries and we have FHE with Michelle's family tonight, and I move to Port Orange in the morning. Should be a partayy. Well, I hope y'all have a splendid week! We don't have to be friends... That's the cool part of a mission. I do my hair everyday... I don't just wake up and think "ehhh... Not today." I love y'all more than I love Lake Helen... And that's a lot.